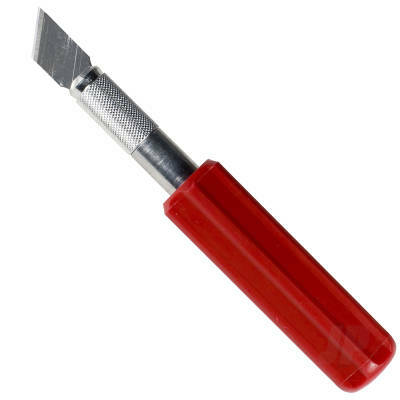 En kraftig hobbykniv som er beregnet på Heavy duty knivblader. Alle standard knivblader passer. Skaftet gir ett godt grep, solid og godt å holde i. Engineered with a thick machined aluminum shaft and plastic handle. A snug four jaw aluminium chuck fitting and textured grip handle for maximum control and stability. Fits Excel’s heavy duty steel blades with a .345in shank. Light weight body fits with all standard craft knife blades including Xacto Knife.